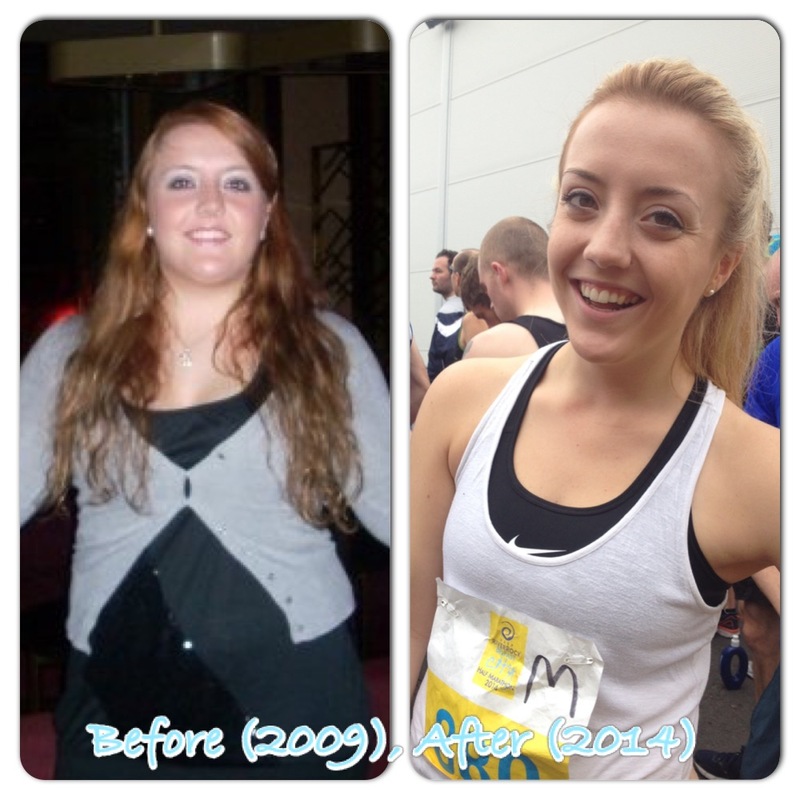 Green Food and Running Shoes – A blog about weight loss, fitness and healthy living. The left-hand picture is me in 2009 at the height of my party lifestyle and the right-hand picture is me in 2014 as I finished my first half marathon. This is a story about how I went from fat to fit and everything along the way. Hi! My name is Emma and I am a busy twenty-something currently living and working in London, United Kingdom. My weight loss journey is ongoing and so far I have already lost over 50 lbs without any personal trainers*, nutritionists, diets, pills or surgery. Has it been easy? Absolutely not! But it has been highly rewarding and the journey has given more more strength and confidence than I had ever imagined. My goal started as weight loss but it has now transformed into achieving a healthy lifestyle. There have been bumps, tears, bruises and set-backs along the way**. So it is important to me that I share my experiences with as much honesty and transparency as possible (these are both severely lacking in the blogosphere). My personal experiences, fitness tips and food creations will be shared on this blog with the hope of inspiring anyone who wants to get healthy or who just wants to try something new. Running and plant-based foods are my two favourite things, which inspired me to name this blog ‘Green Food and Running Shoes‘ but as you can probably guess, there is a lot more to it than that. I don’t believe in labels and I’m always learning new things, so I like to try out diets, fads and trends but I don’t limit myself to any one in particular. My favourite thing to do is to write about what is on my mind or what is “hot” right now in the fitness world. Oh, and I love food… so there will be a lot of my thoughts and recipes on here, but plenty more on my Facebook and Instagram accounts as well. Thanks for reading and if you like it, please share it! *Update: In January 2015, I decided to employ a PT for 12 weeks to teach me how to start lifting heavier weights safely, as well as helping me rehabilitate an injury to my biceps tendon. **Update: Weight-loss phase 2 began in Spring 2017 after some health issues and a few major events in my personal life caused me to put on a few pounds. But hey, it’s a journey, not a destination. I’m excited for phase 2 now that I have a lot of valuable knowledge and experience under my belt. Marja, of course I remember you! How could I forget? 🙂 Thank you so much for your comment, it really made me smile! I hope you are well! Awesome first blog post. Really looking forward to your future posts!